How To Make Money From Foreclosures? No question, foreclosures are at a record number right now. After a period of aggressive lending, more and more people are finding it impossible to meet their mortgage repayments. The banks and other lenders, in turn, are foreclosing on more and more properties. I think the banks committed “foreclosure suicide” when they issued some of these adjustable loans and creative loan programs to people who really shouldn’t be getting those loans. They are now seeing the fruits of their labor. Given the crash in property prices across the nation… this means huge opportunities for the savvy real estate investor. So in this article I’ll outline the main ways you can make money from foreclosures. Okay, so what is a foreclosure? 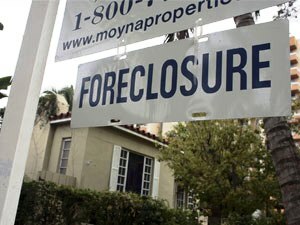 Basically, a foreclosure arises where someone who has borrowed money from a bank or other lender to buy a property — and has given the lender the property as security for the loan — fails to meet their mortgage repayment obligations… and the lender decides to repossess and sell the property as a result. There are three main foreclosure investment opportunities, depending on the status of the foreclosed home in the foreclosure process. The first way to profit is if the property is in pre-foreclosure. At this point, the bank (or other lender) has sent the defaulting mortgagor a certified letter requiring them to make good all their outstanding repayments by a particular date. If you were to then step in and offer to buy the home from the mortgagor, that would stop the foreclosure proceedings. Many homeowners would rather sell their home at a steep discount to an investor like you — in the hope they could make a small profit or at least get rid of their debt — than go through the stress and potentially greater financial loss associated with the foreclosure process. The bank, too, is likely to prefer this outcome. Some tremendous opportunities are within this specific niche right here. You want to get to these deals as quickly as possible. Even if you don’t get the deal right away, followup with the sellers through the foreclosure process–it’s worth it! The second way to make money from foreclosures is when the property is being sold via public auction (or trustee sale). During such an auction or trustee sale, the property must be sold to the highest bidder. Properties being sold at a foreclosure auction are often bought sight unseen, so there are some risks involved. However, if you take this into account when bidding on a particular property — as well as the fact that the bank is eager to sell — an auction may give you a terrific chance to pick up a home at a significant discount to its true market value. Another way to make money from foreclosures is when you negotiate with the bank with a short sale. This is when the homeowner agrees to allow you to work directly with the bank and negotitate the loan balance down. In other words, you are making an offer to the bank for less than their mortgage payment with hopes that the bank will accept your offer and sell the house less than the loan balance. Short sales are a powerful method to obtain equity on the property just by making an offer directly with the bank. Finally, if the property is not sold at public auction, the bank must buy the property itself. If that occurs, the bank will usually be more motivated to get the property off its books. This gives you bargaining power! These bargains are called REO’s or Real Estate Owned properties. So there you have the four of the main and most basic foreclosure investment opportunities in this foreclosure market. With the right strategy in place, and an eye for a good deal, there’s no doubt that you can make huge money in this lucrative area of property investing. Next story Where Will You Find A Mintmark On A Coin? Great post! The house auction has been going crazy here in my local areas. Another good money maker is to bid on tax delinquent properties. Often, you can take over the entire house before bank to over, if the owner can’t afford the tax any more. This is excellent information. I believe that the opportunity to invest in foreclosures may be better than the market that we had in the last few years. We’ve been investing for four years now and it seems easier than ever to find great deals with less competition. Right now we’re involved in negotiating discounts with the banks directly, “Short Sales.” We have been successful at negotating discounts as much as 40 cents on the dollar. To be successful at Short Sales, you’ll want to avoid the top 7 mistakes. This is good advice. I’d like to add that working with a real estate agent that specializes in bank owned real estate can be helpful in getting your offer accepted. They won’t (can’t legally) admit it, but the agent can have lots of pull with the bank. That is, the agent representing the bank, not necessarily the one writing your offer for you. Foreclosures have created a new class of millionaires as well as multi-millionaires. Time for me to cash-in to redeem myself in this recession. .-= Chris´s last blog ..cmccall1987: RT @healthnwealth22: Be who you are and say what you feel because those who mind don’t matter and those who matter don’t mind. – Dr. Seuss =-.